Facebook CEO Mark Zuckerberg is currently putting some of his very vast fortune to work in order to create an artificial intelligence based personal assistant which he is calling Jarvis. If that sounds familiar, it's because in Iron Man and other Marvel Cinematic Universe movies, Tony Stark's AI personal helper is also called Jarvis. 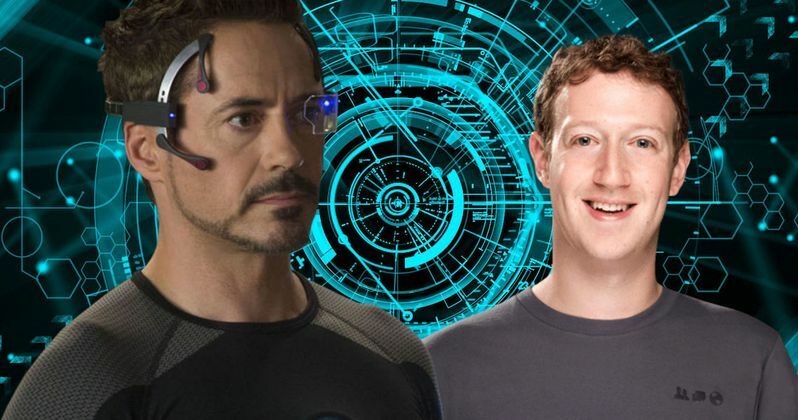 Now, Mark Zuckerberg is looking for someone to provide a voice for his new technology, and Robert Downey Jr. has thrown his hat into the ring. Yesterday, Mark Zuckerberg took to his Facebook profile to do a couple of things. One, to declare that he is indeed working on a real-life version of Jarvis. Two, that he needs someone to provide the voice. He asked the Facebook community for suggestions as to who he should ask to provide the voice and Iron Man himself Robert Downey Jr. sounded off in the comments, offering up his services to the Facebook creator. Here is what he had to say. "I'll do in a heartbeat if Bettany gets paid and donates it to a cause of Cumberbatch's choosing...that's the right kind of STRANGE!" There are a few things going on with his reply that are worth talking about. The first and most obvious being that it would be pretty awesome to have the guy who plays Iron Man actually voice Jarvis in real life. Mark Zuckerberg seemed to echo that sentiment, replying to Robert Downey Jr.'s comment with "This just got real." Also, the "Bettany" he is referring to is Paul Bettany, who voiced Jarvis in the MCU and is now playing Vision ever since the character was brought to life in Avengers: Age of Ultron. Lastly, he name drops Benedict Cumberbatch who is about to join the MCU next month as Doctor Strange and Downey couldn't help but make a joke about it. Whether or not Robert Downey Jr. is totally serious remains to be seen, but fans went crazy for the idea in the comments section and Mark Zuckerberg has pretty deep pockets, so it seems like a very real possibility. Granted, he didn't seem to actually want the money himself. Instead, wanting the money to ultimately go to charity after passing through the hands of a couple of his present and future Avengers co-stars. It's not like Robert Downey Jr. needs the money at this point anyway, given that he has been one of the highest paid actors in Hollywood for several years now. In the Marvel movies, Jarvis actually stands for Just A Rather Very Intelligent System. It isn't really clear how far along Mark Zuckerberg's version of Jarvis is or just how intelligent it will be, but it is far enough along that he wants someone to provide a voice. Assuming he is serious and that Mark Zuckerberg takes him up on his offer, that voice very well could be Robert Downey Jr.. You can check out their Facebook exchange for yourself below.